Job seekers can send in their Baker Hughes careers application for a chance to work for one of the most successful companies in the oil field sector in the United States. Founded back in 1907, Baker Hughes currently operates worldwide and is a member of the prestigious Fortune 500 list. According to the company’s hiring policy, all candidates applying for Baker Hughes employment must be at least 18 years old to be considered eligible. Please note that all younger applicants will be automatically excluded from the hiring process. Job seekers will find the complete list of Baker Hughes job opportunities on the company’s employment portal. They will be able to explore the company’s diverse array of career departments to get an idea of the available positions at Baker Hughes. Before we go on to describe the main steps in the Baker Hughes application process, we would like to point out to job seekers that the hiring process is entirely free of charge. According to the Recruitment Advisory on the company’s official website, candidates should bear in mind that fraudulent attempts have been made in association with Baker Hughes to make job seekers pay in order to expedite the assessment process. They should recognize these attempts as fake because at no point in the development process are they required to make any type of payment. According to the Baker Hughes employment policy, all candidates seeking to be included in the hiring process should send in an online application form via the company’s employment portal. We will describe each section of the standard jobs and employment form utilized by the company to provide job seekers with an overview of the information they need to include. This is the first section of the Baker Hughes careers application form. 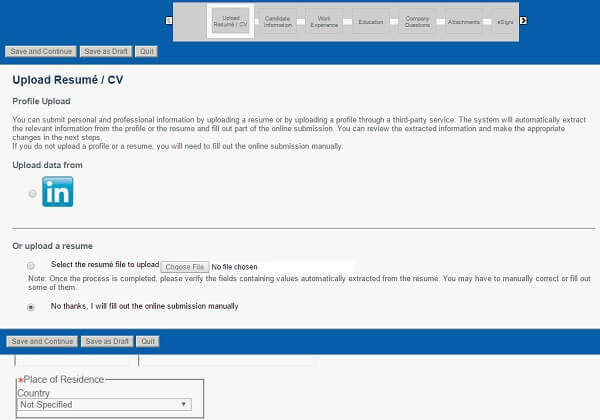 Candidates may opt to upload their resumes to use the portal’s data-fill tool. 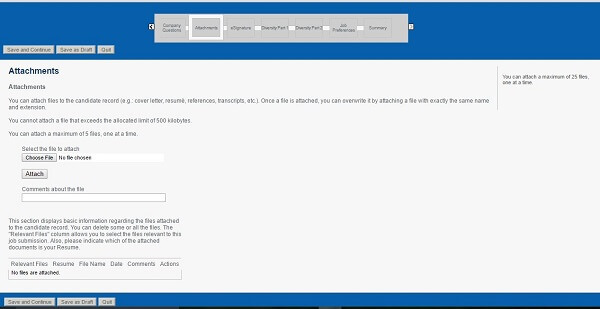 This will transfer information from their CVs to the relevant sections in the form. This way they can save a lot of time when filling in the form because some of the sections will be automatically completed. However, if candidates prefer to fill out their forms manually, they can do so by simply proceeding to the following section. This section of the Baker Hughes careers application form requires candidates to type in their complete contact information. This will be used by the HR specialists to contact them in regards to the upcoming steps of the hiring process. Please note that this section is mandatory. For this section of the Baker Hughes careers application form, candidates are expected to provide an overview of their professional experience. They will have to make separate entries for each of the previous positions they deem relevant for the Baker Hughes employment process. 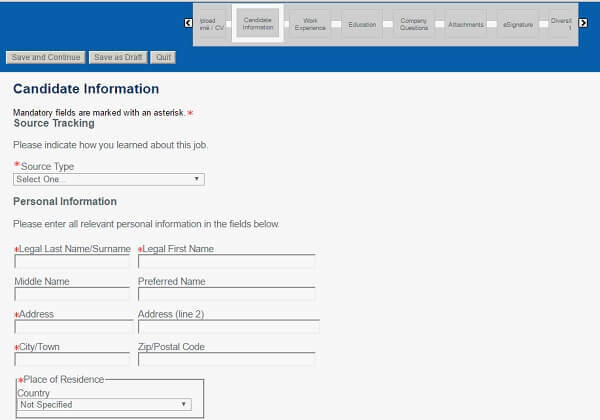 The data-fill tool will populate this section with information from the candidates’ resumes. They will then have to make sure that the transfer is correct and complete. This section of the Baker Hughes careers application form requires candidates to provide information about their academic background. They must include at least one entry for this section. They should aim to create a complete overview of the educational programs they have been enrolled in. This section of the Baker Hughes careers application form features a short questionnaire meant to assess if the candidates are able to comply with the main employment eligibility criteria enforced by the company. They will be asked about their age, their legal authorization to work in the U.S., as well as any previous employment they may have had at Baker Hughes. Please note that this section is mandatory. 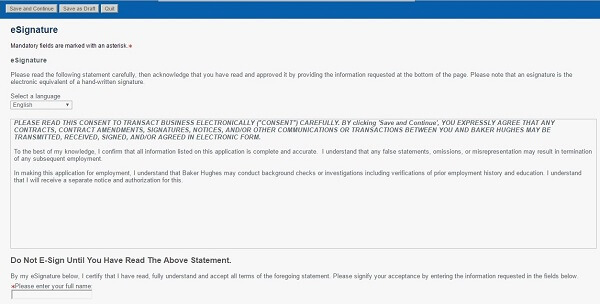 For this section of the Baker Hughes careers application form, candidates may upload their resumes, along with all of the additional documents they deem relevant to the hiring process. Please note that even if they have uploaded them for the Upload Resume/ CV section, candidates should upload their resumes once again for this section. The Attachments section is entirely optional. 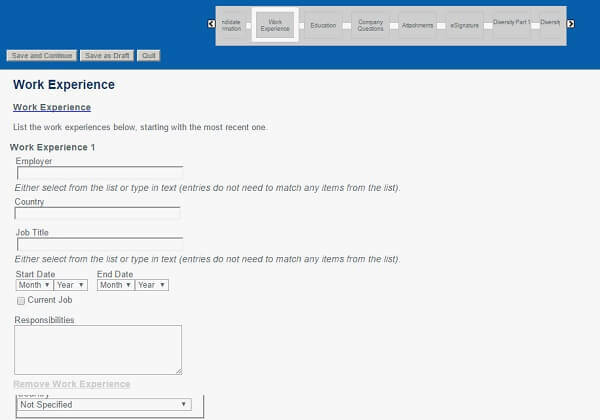 For this section of the Baker Hughes careers application form, candidates are required to read the Data Accuracy Statement featured on the portal. They will have to certify that all the information they have included is correct and complete, to their best knowledge. To validate the document, they will be asked to provide their electronic signature. For this section of the Baker Hughes careers application form, candidates will have to answer four questions regarding their gender, race, ethnicity, and protected veteran status. The information extracted from the form will then be used for statistical purposes. Please note that candidates are required to choose one of the provided answers for each question. However, they are not obligated to disclose any details about themselves that they do not feel comfortable sharing with the hiring specialists. For this section of the Baker Hughes careers application form, candidates will be asked to provide information about the disabilities they might be suffering from. As for the previous section, they will be asked to provide an answer for the questions featured here, but they will not be obligated to disclose any details they do not wish to. Candidates are required to provide their names and the current date to validate the Voluntary Self-Identification of Disability Form. This is the final section of the Baker Hughes careers application form. Candidates will be able to view their completed employment forms and make any modifications they deem necessary. After they complete their reviews, they can submit their forms to the HR department for the formal assessment process. Please note that they will be able to track their application process on the portal. 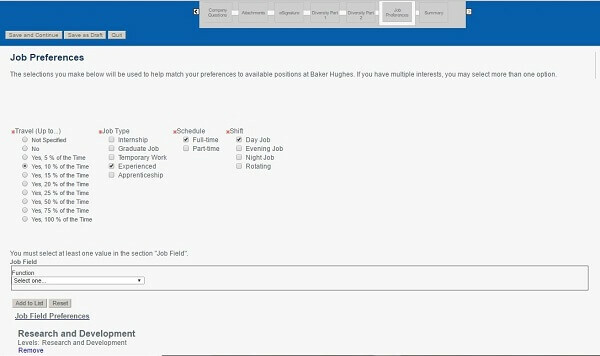 Job seekers will find the updated career listings at Baker Hughes on the company’s employment portal. They will have to submit their forms online via the careers portal to be considered for their chosen positions. Baker Hughes provides young professionals with excellent opportunities for acquiring new skills from some of the brightest minds in the oil processing sector. They will get a first-hand experience of the oil industry, which will prepare them for specific situations they will come across during their upcoming employment. The exact rates offered to interns will be negotiated during their interviews. Baker Hughes salaries range between $20.00/ hour and as much as $39.00/hour depending on the candidates’ skills and professional expertise. Job seekers aiming for Baker Hughes careers in management will find the complete list of opportunities for employment on the company’s employment portal. They will have to submit their applications online to be considered for their chosen positions. Healthcare Baker Hughes Employee Benefits: Medical Plan, Dental Plan, Vision Plan, Mental Health Care Plan, and Paid Prescription Coverage. Financial Baker Hughes Benefits: Competitive Baker Hughes Salaries, Baker Hughes Employee Stock Purchase Plan, 401(k) Plan, Equity Incentive Plan, Supplemental Workers Compensation Plan. Insurance Baker Hughes Benefits: Basic Life Insurance Plan, Supplemental Life Insurance Plan, Disability Insurance Plan, Occupation Accident Insurance Plan, AD&D Insurance Plan. Paid Time Off Baker Hughes Employee Benefits: Paid Vacations, Paid Time Off, Paid Holidays, Sick Days, Volunteer Time Off, Bereavement Leave. Special Baker Hughes Benefits: Baker Hughes Employee Discount, Employee Assistance Program, Legal Assistance, Tuition Assistance, Professional Development Program, Job Training. 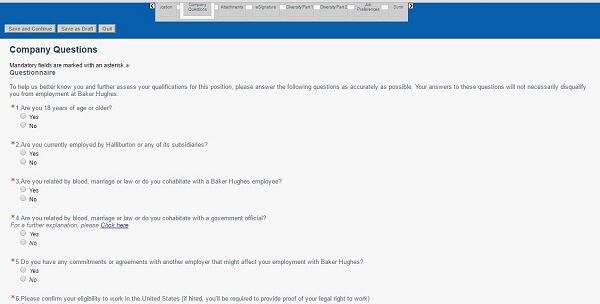 The Baker Hughes careers application form is quite easy to fill out because it mainly consists of questionnaires that the candidates must go through. As for the sections they will have to fill in with information about their professional and academic experience, they may opt to use the portal’s data-fill tool. This will save them a lot of time because it will use the information in their resumes to populate the Work Experience and Education sections in the form. However, we strongly advise candidates to review the data transfer because errors may occur during this process. They should make sure that the transferred information is correct and complete before they send in their forms to the HR department. We recommend that candidates provide their resumes to the Baker Hughes application form because this will give the HR specialists access to a diverse array of details about their professional background. They should also write cover letters for the Baker Hughes careers form because this will enable them to add a personal touch to their applications. They should mention what drove them to apply to the company and the personal and professional abilities that make them solid candidates for employment. Before we go on to describe the hiring process developed by Baker Hughes, we would like to point out once again that it is entirely free. Under no circumstance will company officials require job seekers to pay any type of fees as part of their employment process. As such, candidates should be aware that fraudulent attempts to make them pay might be made and that they are to ignore them completely. The Baker Hughes employment specialists will select the best-suited candidates from all the applicants based on their professional skills and expertise. The selected candidates will then be called in for the interview process, which will be in line with the career level and the department chosen by the candidates. The number of job meetings that candidates must sit through depends on the evaluation requirements associated with the Baker Hughes jobs that the candidates are aiming for. Candidates preparing for interviews at Baker Hughes should be thoroughly informed about the oil field sector, as well as the specific services provided by the company, and the main differences between Baker Hughes and its main contenders on the oil market. Such information will enable job seekers to provide elaborate answers to the interviewers’ questions and make a good impression on their job meetings. They should also be able to point out how their professional experience is relevant to the positions they have chosen. To do so, we recommend that they review their resumes and correlate the information featured here with the main facts in the official description for their chosen position. Lastly, candidates should make sure they opt for appropriate interview outfits. These should be in line with the career level they are aiming for. As such, those interviewing for entry-level Baker Hughes jobs should wear business casual attire, while those aiming for high-level positions should opt for formal outfits. As part of their preparation process for the Baker Hughes interview, job seekers are advised to prepare their interview answers. This type of exercise will help them improve their performance at the job meeting. We have selected a few examples of interview questions that have been used to assess candidates seeking Baker Hughes employment. These will help candidates exercise their answers and they will provide them with an idea of the tone of the meeting. Why have you applied for Baker Hughes employment? What do you know about Baker Hughes? Do you consider yourself prepared to meet the requirements of your chosen Baker Hughes career? What are your biggest professional strengths? What about your weaknesses? What can you tell me about yourself that is not featured in your Baker Hughes careers application?